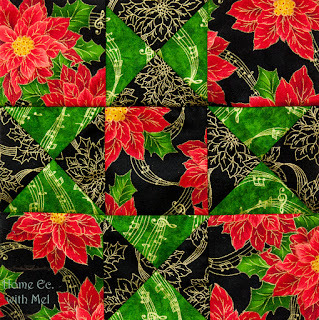 Still working on Christmas projects here. To be completely honest I'll probably be working on Christmas projects right up to Christmas eve. 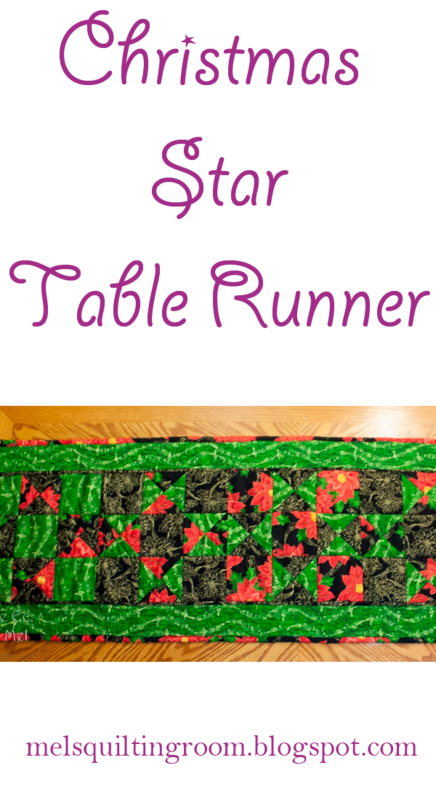 This star table runner is made with fabric from Quilting Treasure. 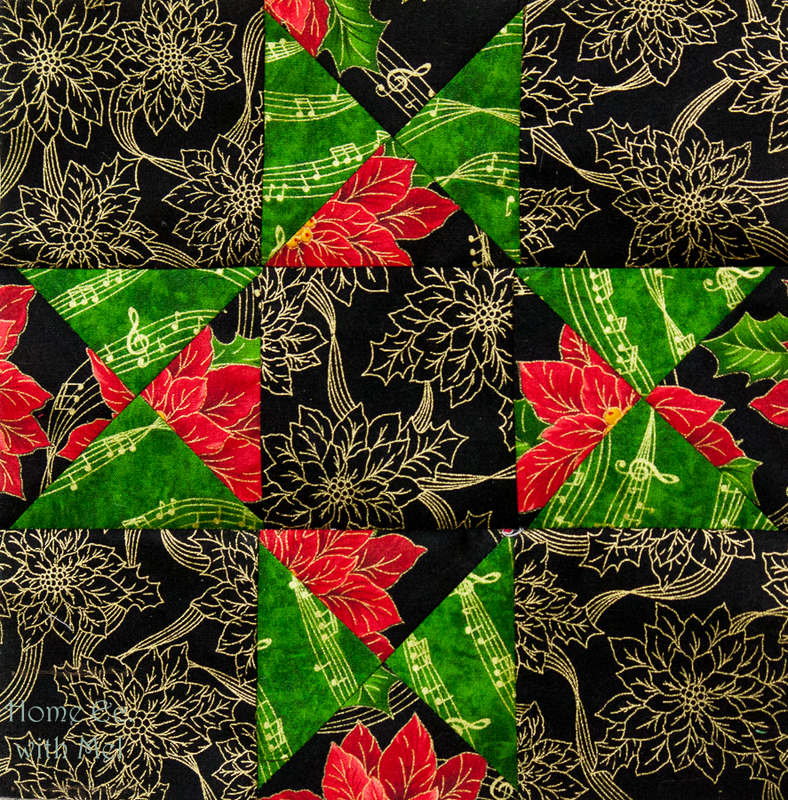 It's the Kennsington Studio, Sound of the Season line of fabric. They have some other fabrics available in the line that I didn't have access to, these were my only three and they are perfect for me. 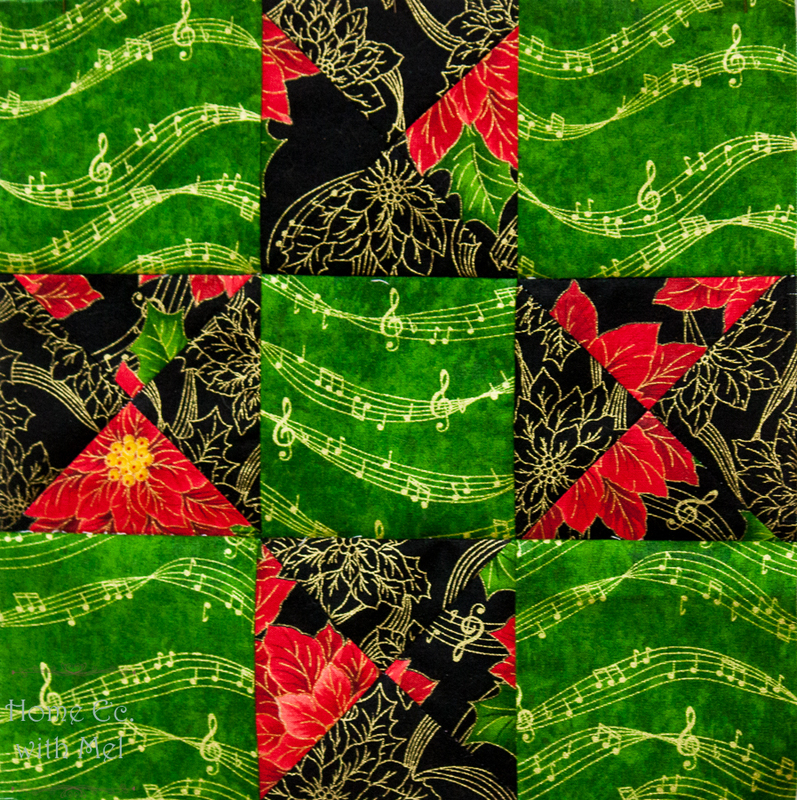 I love music, so being able to bring it into my quilting is so nice. 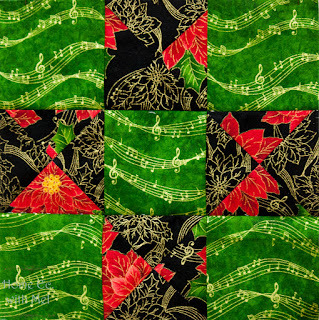 I do listen to it while I sew but it's nice to decorate with music inspired items as well. 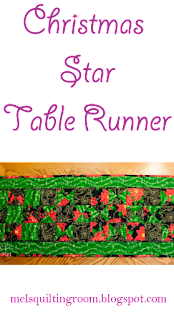 So let's get to making this table runner. The first thing we have to do is make the quarter square block. I cut all of my blocks 5 1/4" to start. You need 4 quarter square blocks per star, and 5 stars for this runner. That's a grand total of 20 quarter square triangles. Each pair of 5 1/4" squares gives you 2 quarter square triangle blocks so you will a grand total of 40 5 1/4" blocks. So now you have your quarter square triangle blocks it's time to set your stars together. This is super easy to do. For each star you need 5 plain blocks cut to the same size as you quarter square triangle blocks. For my blocks I used the "off" color as my solid block. 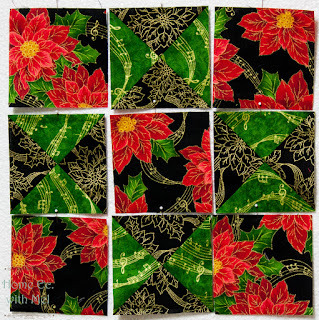 After that, it's a 9 patch quilt block. So many blocks are really 9 patch block variations. So here is a block ready to be sewn. As you can see the one thing you have to keep straight is making sure the same color on your quarter square segment touches the middle segment. Double check this before you sew, trust me. I might have ripped out a couple because one quarter square was in the wrong spot and of course I didn't notice until the whole block was sewn together. You sew left to right and then top to bottom. Make two like this one. Make 2 of these as well. Make 1 of these. This becomes the center with the other blocks going on either side of it. You sew them exactly how they are sewn in this post. One on top of the other, it's a table runner we want narrow and long. Now we boarder it. You need 3 strips of the darkest fabric cut at 3/4" and 3 strips of the lightest fabric cut at 3". I wanted you to see the borders up close. 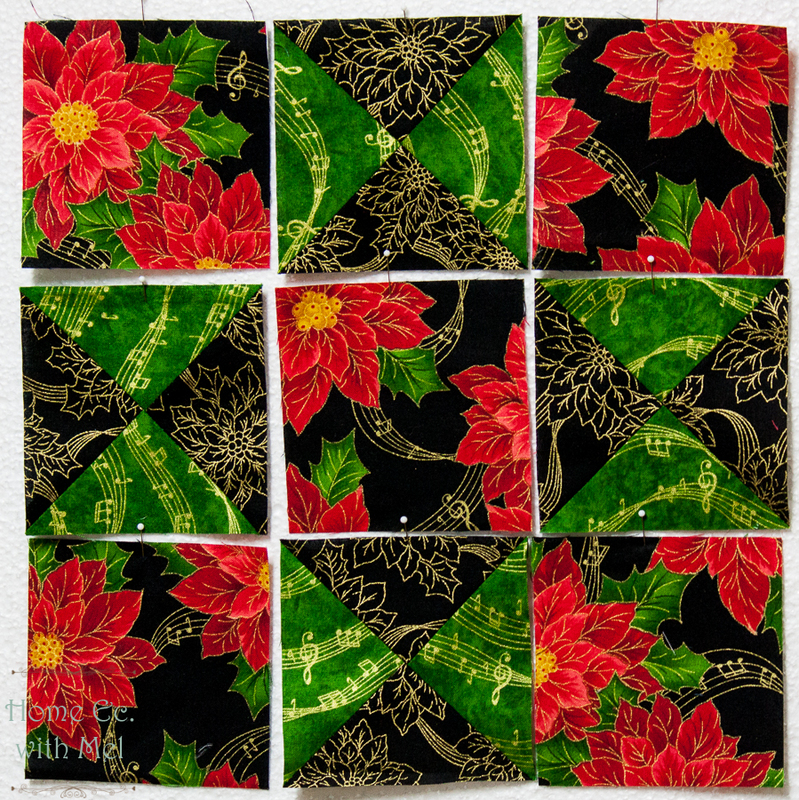 The first mini border is the 3/4" strips, so it finishes at 1/4". TAKE YOUR TIME SEWING THIS ONE ON!! There is no wiggle room when you are doing that size of strip. The second border is the 3" strips. I didn't put anything across the top or the bottom, just along the two sides. 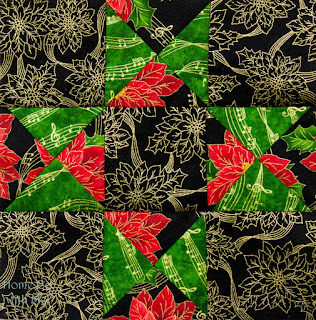 If you look closely, or blow the picture up, you'll see a seam in the green fabric that runs at an angle. Since this top has lots of seams on the edges I didn't want our borders to look wonky if the seams didn't line up, and they wouldn't. So I sewed my border strips just like most people do binding. 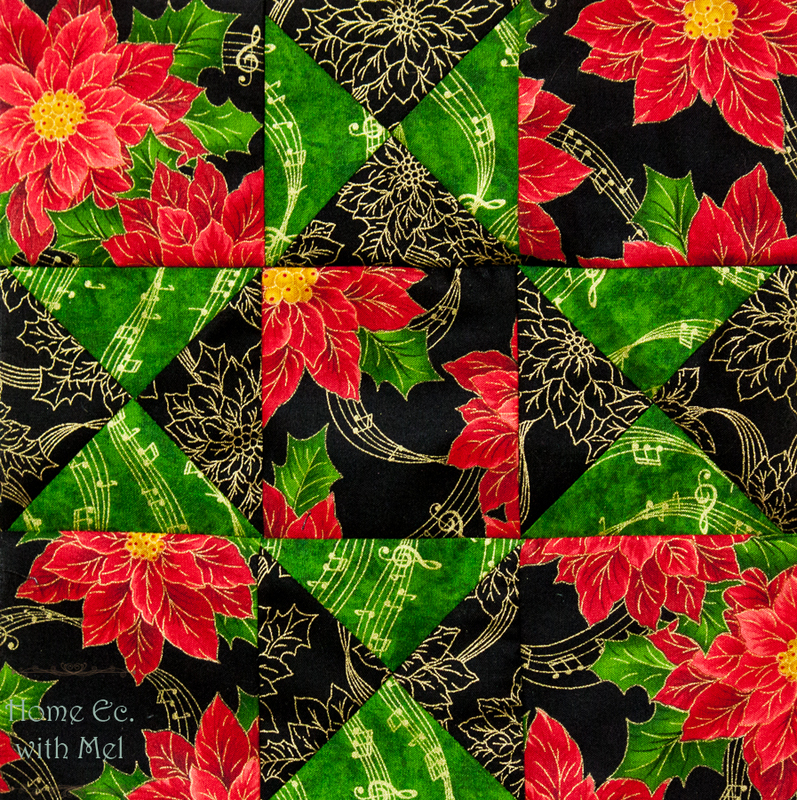 Jenny from Missouri Star Quilt company has a wonderful tutorial on binding. If you skip to 3:10 in the video she'll show you exactly how to make your boarders. Then it's time to quilt your table runner. 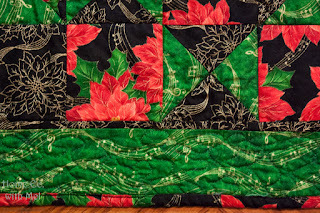 You won't have enough of the front fabrics leftover to back your runner but you will have enough to bind it with the fabric you didn't use to make the borders. Someday, I hope to get comfortable enough with my quilting to have that as one of my demo videos but right now I'm just getting to the point I don't hate it when I finish.